The Borgata Casino of New Jersey is the owner and operator of the BorgataPoker.com, a comprehensive online poker gaming site offered for residents and visitors to the state. The Borgata works in partnership with bwin.party to offer the online poker site, sharing player liquidity with the Party Poker New Jersey site. The site is licensed and regulated by the New Jersey Division of Gaming Enforcement. Borgata Poker offers the full real money experience with cash games, tournaments, promotions and more. Take part in regular ring games, SNG’s, MTT’s or try your hand at winning a seat to a major land-based event on the World Poker Tour or the World Series of Poker. While they’re no longer the only game in town, Borgata Poker still has a lot to offer its players despite having lower traffic numbers than competitors like WSOP.com and PokerStars NJ. Free $20 just for signing up (NJ residents only). Gain rewards points good for free nights at the Borgata Hotel & Casino. Real money poker traffic is limited to New Jersey residents only. Not as many cash games going as their rival, WSOP.com. Sign up for a new player account at Borgata Poker and you will have access to several promotions, including the new player options. Start with the free $20 cash with no deposit or set your sights higher to the 100% bonus worth up to $600 on your first deposit. Either way, you earn extra cash to help you build a solid bankroll! 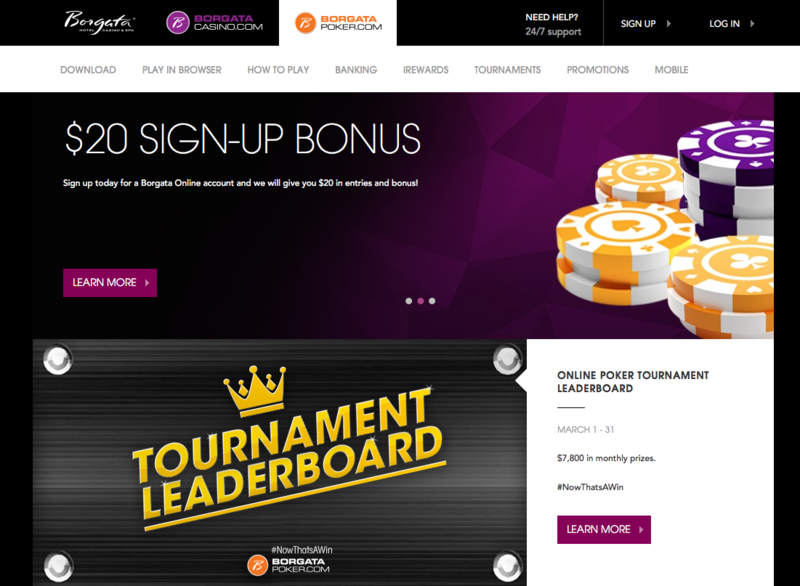 Borgata Poker NJ will ship all new accounts $20 instantly upon sign up. Once you have created a new player account, you will receive $10 in cash and $10 in the form of a standard poker bonus. To clear the bonus cash, all you have to do is earn iRewards Points. With the iRP’s, you will need 40 to clear $10 in bonus cash. These points can be earned via tournament fees or rake contributed at any real money poker game. To get more bang for your buck after becoming a new member of Borgata Poker, consider taking advantage of the first-time deposit bonus. With this bonus, you will be able to earn 100% cash on a deposit up to $600. After you make your deposit, you will be able to view the bonus cash you have earned via the Rewards tab. The bonus cash will be released to your player account in increments of 10% based on the amount you deposited. If you deposited $20, then you would see the bonus cash released in increments of $2. To clear the bonus, you will need to earn iRPs. You will be able to earn these points by taking part in tournament or real money ring games. Once you are a member of Borgata Poker, you will have access to the Borgata IRewards program. This program is an exclusive opportunity for you to earn rewards based on game play. You will be able to earn Comp Dollars as you play and redeem any points you earn for cash, bonuses or tournament entries. Earn rooms and comp dollars for the Borgata Hotel Casino & Spa in Atlantic City as well! The loyalty program allows you to earn 2 points for every $1 you spend in poker tournament fees or table charges. You also have the opportunity to earn points with casino game play. To begin, you will be placed in the ‘Red Label’ loyalty tier. This tier requires 0 points per month. You must then earn 150 points in the month to move up to the ‘Red Label Plus’ tier. 650 points moves you to the ‘Silver Label,’ 2500 moves you to the ‘Black Label’ and 15,000 per calendar quarter moves you to the ‘Black Label Elite’ level. This tier is the only one that is not on a monthly basis. Borgata Poker uses a software platform provided by bwin.party. You have the option to download the poker client which offers the most game choices and features. You can use the browser-based client which is java-based and offers the same games but not all features. Mobile options for your smartphone and tablet are also provided. No matter which software version you choose for your Borgata Poker experience, you will be able to easily navigate the lobby and find cash games and tournaments based on your personal preferences. 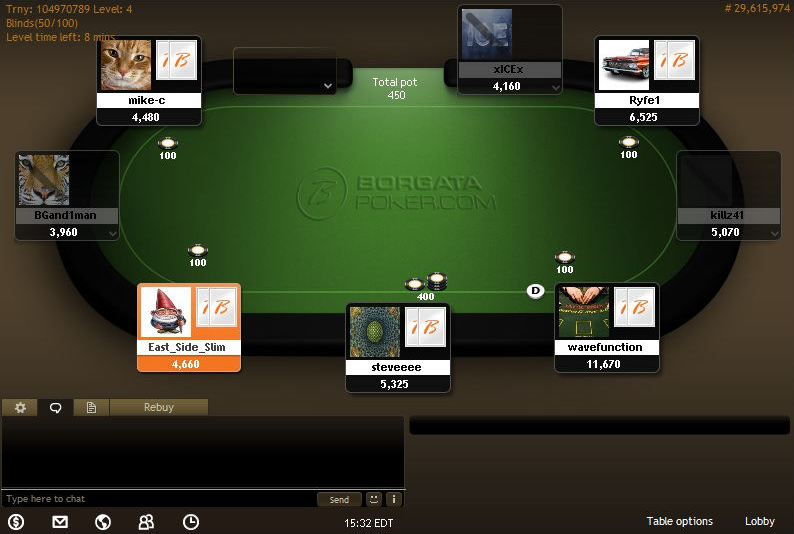 Choose the 1 Click Lobby feature to have access to a direct link to the tables you desire to play. You will be able to experience a carefree gaming environment as you have the option to customize your game play simply and easily. The lobby will display a number of games based on your preferences including cash games, SNG’s, tournaments and ‘Fast Forward’ poker games. Click once to gain access to the option of your choice. The software includes a new bet slider, which provides improved choices for your bet size including ½ and all-in. With the mobile application of Borgata Poker, you can take your game play anywhere within the state of New Jersey. Download an application for online poker gaming for Android or iOS devices to begin playing with your mobile device. You will find the app helps you deposit a little easier and withdraw funds as well. The app offers the same ring games and stakes as the normal standalone Mac/PC client does. The Borgata Poker site provides three types of poker games, Texas Hold’em, 7 Card Stud and Omaha. Each type provides several formats including Fixed Limit and Pot Limit. Omaha can be found in standard version as well as hi/lo. When it comes to tournament game play, you will find options for SNG’s, MTT’s and more. Take part in guaranteed daily tournaments which offer more than $250,000 in prize money each week. Daily freerolls help you enjoy tournament game play without the buy-in, while qualifiers can be found for major live events including the Borgata Winter Poker Open, WPT and WSOP tourneys. Traffic is pretty steady at the Borgata Poker tables, with 24 hour peak averages hitting around 284 players. The 7-day average is 140, based on information at PokerScout. You will find most players stick to the lower to medium stakes ring games at this site. Additionally, most of the more active games are at the No Limit Texas Hold em and PLO tables. The Borgata Casino is an additional option you can enjoy in New Jersey along with the Borgata Poker site. The casino offers quality gaming including tables games like blackjack and roulette, slots with progressive jackpots and more. Take advantage of the Welcome Package for new players to receive $20 free plus a 100% deposit bonus worth up to $100. Since the Borgata Poker site operates in New Jersey, you will find banking options are limited. However, the choices you do have are safe and secure, providing a quick and easy way for you to deposit and withdraw funds. In fact, being a NJ resident makes for the simplest process anywhere when it comes to depositing and withdrawing your cash. For depositing at Borgata, the site recommends Instant eChecks for the quickest deposit. Simply provide the bank routing number and account number and an instant deposit can be made. An online banking transfer allows you to transfer funds to your online poker account or you can even choose to use a *Borgata Online Prepaid Card for depositing. *For the prepaid card, you must enroll to have access and fund your prepaid account with a credit card, debit card or bank transfer. PayNearMe is an option that can be accessed via local 7-Eleven Stores and provides you with an option to pay cash for your deposit. You can also use MasterCard, Visa, Skrill, Neteller and the Borgata Cashier Cage for depositing funds. When it comes to withdrawing funds, you do have less options than depositing. However, the ease of use in this process is just as simple as depositing funds into your account. Use the Borgata Cashier to be able to withdraw cash quickly, which is of course located directly at Borgata Hotel Casino & Spa property. You will need to receive a Voucher ID via email and then present this ID as well as your personal ID to the cashier to be able to withdraw funds. An instant check/ bank transfer or check by mail are options using your financial institution to withdraw funds. Neteller, Skrill and Borgata Online Prepaid Card are additional withdrawal options. All withdrawal or deposit minimum and maximum amounts are dependent on the payment method used and can be found on the website or by emailing support for additional information.